WASHIGTON, DC (FAS | IDN) - The number of U.S. strategic warheads counted as “deployed” under the New START Treaty has dropped below the treaty’s limit of 1,550 warheads for the first time since the treaty entered into force in February 2011 – a reduction of 263 warheads over four and a half years. Russia, by contrast, has increased its deployed warheads and now has more strategic warheads counted as deployed under the treaty than in 2011 – up 111 warheads. Similarly, while the United States has reduced its number of deployed strategic launchers (missiles and bombers) counted by the treaty by 120, Russia has increased its number of deployed launchers by five in the same period. Yet the United States still has more launchers deployed than allowed by the treaty (by 2018) while Russia has been well below the limit since before the treaty entered into force in 2011. These two apparently contradictory developments do not mean that the United States is falling behind and Russia is building up. Both countries are expected to adjust their forces to comply with the treaty limits by 2018. Rather, the differences are due to different histories and structures of the two countries’ strategic nuclear force postures as well as to fluctuations in the number of weapons that are deployed at any given time. The latest warhead count published by the U.S. State Department lists the United States with 1,538 “deployed” strategic warheads – down 60 warheads from March 2015 and 263 warheads from February 2011 when the treaty entered into force. But because the treaty artificially counts each bomber as one warhead, even though the bombers don’t carry warheads under normal circumstances, the actual number of strategic warheads deployed on U.S. ballistic missiles is around 1,450. The number fluctuates from week to week primarily as ballistic missile submarines (SSBNs) move in and out of overhaul. Russia is listed with 1,648 deployed warheads, up from 1,537 in 2011. Yet because Russian bombers also do not carry nuclear weapons under normal circumstances but are artificially counted as one warhead per bomber, the actual number of Russian strategic warheads deployed on its ballistic missiles is closer to 1,590 warheads. Because it has fewer ICBMs than the United States (see below), Russia is prioritizing deployment of multiple warheads on its new intercontinental ballistic missiles (ICBMs). In contrast, the United States has downloaded its ICBMs to carry a single warhead – although the missiles retain the capability to load the warheads back on if necessary. And the next-generation missile (GBSD; Ground-Based Strategic Deterrent) the Air Force plans to deploy a decade from now will also be capable of carry multiple warheads. Warheads from the last MIRVed U.S. ICBM are moved to storage at Malmstrom AFB in June 2014. The sign “MIRV Off Load” has been altered from “Wide Load” on the original photo. Image: US Air Force. This illustrates one of the deficiencies of the New START Treaty: it does not limit how many warheads Russia and the United States can keep in storage to load back on the missiles. Nor does it limit how many of the missiles may carry multiple warheads. And just a reminder: the warheads counted by the New START Treaty are not the total arsenals or stockpiles of the United States and Russia. The total U.S. stockpile contains approximately 4,700 warheads (with another 2,500 retired but still intact warheads awaiting dismantlement. Russia has a stockpile of approximately 4,500 warheads (with perhaps 3,000 more retired warheads awaiting dismantlement). The New START Treaty count lists a total of 762 U.S. deployed strategic launchers (ballistic missiles and long-range bombers), down 23 from March 2015 and a total reduction of 120 launchers since 2011. Another 62 launchers will need to be removed before February 2018. Four and a half years after the treaty entered into force, the U.S. military is finally starting to reduce operational nuclear launchers. Up till now all the work has been focused on eliminating so-called phantom launchers, that is launchers that were are no longer used in the nuclear mission but still carry some equipment that makes them accountable. But that is about to change. On September 17, the Air Force announced that it had completed denuclearization of the first of 30 operational B-52H bombers to be stripped of their nuclear equipment. Another 12 non-deployed bombers will also be denuclearized for a total of 42 bombers by early 2017. That will leave approximately 60 B-52H and B-2A bombers accountable under the treaty. The Air Force is also working on removing Minuteman III ICBMs from 50 silos to reduce the number of deployed ICBMs from 450 to no more than 400. Unfortunately, arms control opponents in the U.S. Congress have forced the Air Force to keep the 50 empted silos “warm” so that missiles can be reloaded if necessary. Finally, this year the Navy is scheduled to begin inactivating four of the 24 missile tubes on each of its 14 Ohio-class SSBNs. The work will be completed in 2017 to reduce the number of deployed sea-launched ballistic missiles (SLBMs) to no more than 240, down from 288 missiles today. Russia is counted with 526 deployed launchers – 236 less than the United States. That’s an addition of 11 launchers since March 2015 and five launchers more than when New START first entered into force in 2011. Russia is already 174 deployed launchers below the treaty’s limit and has been below the limit since before the treaty was signed. So Russia is not required to reduce any more deployed launchers before 2018 – in fact, it could legally increase its arsenal. Yet Russia is retiring four Soviet-era missiles (SS-18, SS-19, SS-25, and SS-N-18) faster than it is deploying new missiles (SS-27 and SS-N-32) and is likely to reduce its deployed launchers more over the next three years. Russia is also introducing the new Borei-class SSBN with the SS-N-32 (Bulava) SLBM, but slower than previously anticipated and is unlikely to have eight boats in service by 2018. Two are in service with the Northern Fleet (although one does not appear fully operational yet) and one arrived in the Pacific Fleet last month. The Borei SSBNs will replace the old Delta III SSBNs in the Pacific and later also the Delta IV SSBNs in the Northern Fleet. The latest New START data does not provide a breakdown of the different types of deployed launchers. The United States will provide a breakdown in a few weeks but Russia does not provide any information about its deployed launchers counted under New START (nor does the U.S. Intelligence Community say anything in public about what it sees). As a result, we can’t see from the latest data how many bombers are counted as deployed. The U.S. number is probably around 88 and the Russian number is probably around 60, although the Russian bomber force has serious operational and technical issues. Both countries are developing new strategic bombers. Four and a half years after the New START Treaty entered into force in 2011, the United States has reduced its “accountable” deployed strategic warheads below the limit of 1,550 warheads for the first time. The treaty limit enters into effect in February 2018. Russia has moved in the other direction and increased its “accountable” deployed strategic warheads and launchers since the treaty entered into force in 2011. Not by much, however, and Russia is expected to reduce its deployed strategic warheads as required by the New START Treaty by 2018. Russia is not in a build-up but in a transition from Soviet-era weapons to newer types that causes temporary fluctuations in the warhead count. And Russia is far below the treaty’s limit on deployed strategic launchers. Overall, however, the New START reductions are very limited and are taking a long time to implement. Despite souring East-West relations, both countries need to begin to discuss what will replace the treaty after it enters into effect in 2018; it will expire in 2021 unless the two countries agree to extend it for another five years. It is important that the verification regime is not interrupted and failure to agree on significantly lower limits before the next Non-Proliferation Treaty review conference in 2020 will hurt U.S. and Russian status. Moreover, defining lower limits early rather than later is important now to avoid that nuclear force modernization programs already in full swing in both countries are set higher (and more costly) than what is actually needed for national security. * Hans M. Kristensen is the director of the Nuclear Information Project at the Federation of American Scientists where he provides the public with analysis and background information about the status of nuclear forces and the role of nuclear weapons. Photos: (1) Warheads from the last MIRVed U.S. ICBM are moved to storage at Malmstrom AFB in June 2014. The sign “MIRV Off Load” has been altered from “Wide Load” on the original photo. Image: US Air Force. 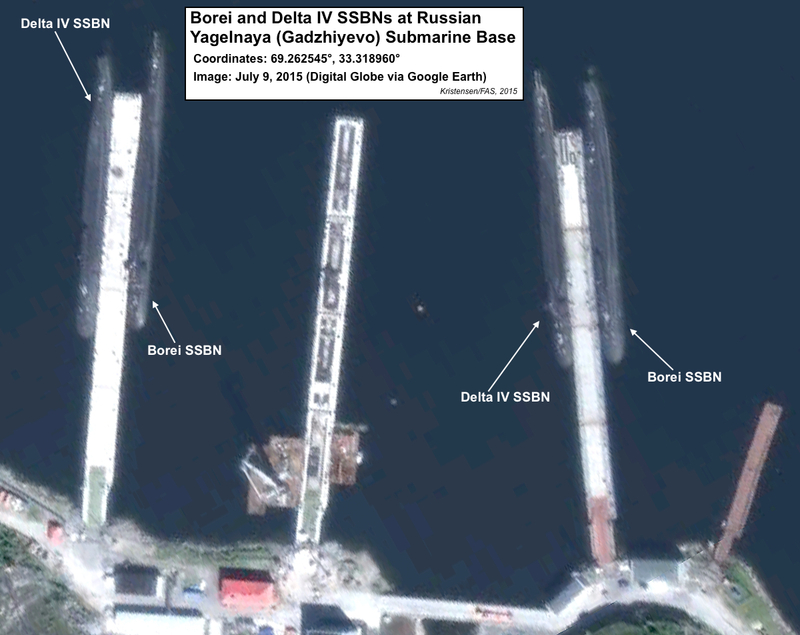 (2) Russian Borei- and Delta IV-class SSBNs at the Yagelnaya submarine base on the Kola Peninsula. Click to open full size image.